The last time you were visiting Mom, did you happen to look in her refrigerator or cupboards? Did they contain the foods you remember when you were growing up? Were there fresh items, dairy products such as milk with current expiration dates? Was there some nutritional balance in the assortment of foods. Does Mom still seem to enjoy her food as she once did? If you answered yes to all of the above, then you probably have more to learn from your mom then from reading this article, but do pass it along to someone who may be noticing a change in the eating habits in their elder relative. As people age, their metabolism and appetite can go through changes and be quite different from when they were younger. That said, they still need proper nutrition even if their appetite is smaller or they’ve lost interest in what used to be some of their favorite foods. Eating causes oral discomfort If you notice some wincing or resistance when chewing food, ask Mom if she is having difficulty chewing. A visit to the dentist may be in order. Seniors often need reminders about regular dental appointments or have challenges with transportation. You can take Mom yourself or locate a mobile dentist, which is becoming a common service. Does food taste good? Elderly people or those with certain illnesses can lose their sense of taste. Try preparing (or coaching whoever is preparing meals) to add foods with more texture, color (for visual appeal), seasonings such as garlic, ginger, chili pepper, cinnamon, and others to add more flavor. Don’t make it too hot! Mom’s days of eating jalapeño peppers may be over, if she ever liked them at all, but certain spices and flavorings can make food more appealing. Is grocery shopping a struggle? As low energy level and mobility issues come into play, this is a problem that can be solved in several ways: shop for Mom yourself, take her out to the grocery store, (even if shopping with her takes twice as long as it would take you — it can be an outing). Look into grocery stores that deliver (many Safeway stores, Whole Foods, and Costco outlets deliver now for a nominal charge or no charge at all), hire some help from an in-home care agency to have someone shop and maybe cook some meals. Meals can also be cooked in advance and frozen in small containers. Eating alone can feel very lonely Those of us who are still in the stage of life where we regularly have lively, sometimes chaotic meals with lots of talking and activity may crave some quiet, solo mealtimes. Not so for seniors who live alone, spend much of their time by themselves, or feel depressed. Plan a weekly or bi-weekly meal with your loved one, maybe one at their home and one at a restaurant if that is doable. Perhaps talk to some other friends and relatives and enlist them in joining Mom for a meal every now and again. 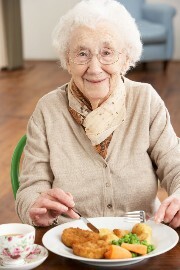 If Mom is mobile, find a senior center that offers group meals, even for a small fee. Bring her to your home for an occasional meal. Is budget limiting grocery shopping? If you know that lack of funds is an issue, look for programs such as Meals on Wheels, for home delivery of pre-made meals. There are food pantries in most communities and if you can’t take Mom during hours when they are open, perhaps again, an in-home care provider can spend a few hours a couple of times a week taking Mom to the pantry and then share a meal together and cook something in advance. Organize a lunch with some of Mom’s friends and have them over. Maybe Mom can help prepare. It is really easy for a senior who may be depressed or lonely to lose interest in food and become weak, debilitated, or even more susceptible to illness. Some small efforts on your part may result in a big, positive outcome for the person who used to be the one to take your nutrition and favorite foods very seriously.